Many Monacans began leaving their settlement in Amherst County after the Racial Integrity Law passed in 1924. Classified as “colored” and unable to marry anyone considered white or have their race recorded as Native American on marriage licenses and birth certificates, they moved to Maryland and Tennessee, just past the Virginia border. The annual Homecoming Reunion and Bazaar was first held in 1969 as an event to bring people back to celebrate their heritage on Bear Mountain. Many Monacan people came to reunite with relatives, eat lunch, raise money for scholarships, and see the drummers and dancers perform. People of all ages and backgrounds attended the event. According to Monacan traditions, Monacans have lived in the Piedmont of Virginia for 10,000 years. Monacan history, like that of many minority groups in the United States, is not always a very happy tale. By about 1730, nearly all of the Monacan people had been forced westward from villages like Monasukapanough. Many resettled in what would become Amherst County; they were established there by 1742 when a party of scouts explored the region prior to the establishment of the Hat Creek Presbyterian Colony. In 1831, William Johns purchased 52 acres of land on Bear Mountain. By the 1850 census, 29 families, mostly related to the Monacan community, were living near Bear Mountain, and in 1908 an Episcopal Mission was founded. 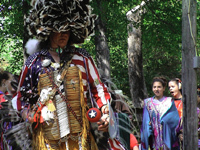 The Monacan Nation was finally recognized by the Virginia General Assembly as one of the eight indigenous tribes of the state in 1989. They are currently in the process of applying for federal recognition. Walter Plecker, author of the Racial Integrity Act and former head of Virginia’s Vital Statistics, made things very difficult for Virginia’s native groups. He claimed that there were no Indians in the state, but only “blacks” and “mulattos”. He and other state officials changed nearly all of the official documents that listed race to classify all of Virginia’s American Indians in one of these two categories. This effectively eliminated the documentary evidence of Virginia’s eight tribes’ existence, an act that has been called “paper genocide”. Plecker’s resignation in 1946 was the first sign of better times to come for the Monacan people. During the 1960s, with the coming of desegregation, Monacan students were permitted to attend public schools, and eventually, their Monacan heritage could be seen as a source of pride. There are 19 photographs of the Monacan settlement in Amherst County, Virginia in the Jackson Davis collection. These photographs, along with almost 6,000 others, were intended to bring publicity to the poor condition of the education system for African American students in the Southeastern United States in the first half of the 20th century. American Indians in Virginia were legally classified as African Americans at this time. They were not welcome in the “white” or “black” schools, and pretty much kept to themselves in Amherst County. The schoolhouse featured in many of the pictures is still standing today; it is currently being renovated. It was used as a schoolhouse until the 1960s, when the Monacans were finally successful in getting some of their children into public schools. The Episcopal Mission church, though burned in 1930, was replaced by a very similar building that still exists.